On Tuesday 24th March we will be welcoming the last guest in the 2015 Winchester Reading Series. Sri Lankan born novelist, filmmaker and artist. Her novels include Mosquito; The Swimmer and Brixton Beach. 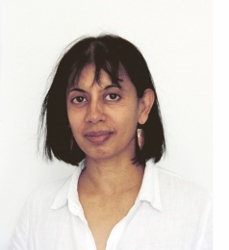 She has received award nominations for, among others, the Costa, the Orange Prize and the Asian Man Booker prize. On Tuesday evening Roma will be taking a break from her stint as Writer in Residence at the Imperial War Museum’s Archives to talk about her work and answer questions from the audience. If you would like to be part of this free, public event, please be in St Alphege room 001 ready for a 6.00 pm start. To find out more about Roma before Tuesday you can visit her website. This entry was posted in Winchester Reading Series 2015 and tagged Roma Tearne, Sri Lanka, University of Winchester, Wincester Reading Series, writer by Litmus 2015. Bookmark the permalink.